Visiting Yesterland is an all-day activity, so you’ll want to plan on at least one meal at the park. You could just grab a quick hot dog or hamburger, but how about a table-service breakfast, lunch, or dinner in a real restaurant? How about this one, as described in an advertising supplement in the Southern California newspapers on July 15, 1955? 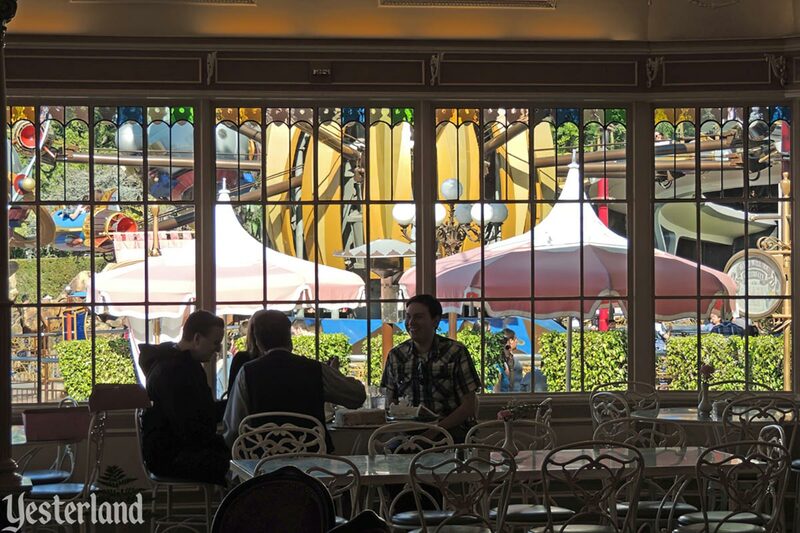 The Red Wagon Inn is one of several charming eating places in Disneyland. It is resplendent in the elegance of a by-gone area reminiscent of the famed eating houses of yesterday. All appointments are authentic mementos of the gay and glamorous 90’s—including the stained glass ceiling, entrance hall and foyer taken from the St. James home in Los Angeles, one of the West’s most noted old mansions. Atmosphere, however, is not confined to the building alone. The menu itself brings back visions of historic good eating—featuring steaks and chops. How about Swift’s Premium Roast Prime Rib of Beef au Jus? Or maybe Swift’s Premium New York Cut Sirloin Steak? Your choices aren’t limited to beef. Perhaps you would enjoy Swift’s Premium Grilled Pork Chops with Spiced Crab Apple? Swift’s Premium Ham Steak with a Pineapple Slice? Swift’s Premium Roast Young Tom Turkey with Dressing, Candied Sweet Potatoes, and Cranberry Jelly? Or Swift’s Premium Lamb Chops with Mint Jelly? There’s also Grilled Halibut Steak with Lemon Butter—not branded as “Swift’s Premium” because, apparently, Swift & Company is not in the fish business. The Red Wagon Inn has halibut on its menu anyway. That’s just part of the extensive menu. Your dinner price includes salad, potatoes, vegetables, rolls, and a beverage. Add a Baked Idaho Russet for 35 cents. There’s also a menu for guests younger than 12. Meals include dessert—“Choice of Ice Cream, Sherbet, Jell-O or Ice Cream Bar”—and a beverage—“Choice of Milk, Chocolate or Buttermilk.” Children love buttermilk, right? For babies, Red Wagon Restaurant serves genuine Swift’s Meats for Babies. For 25 cents per can, choose from Strained Beef, Strained Veal, Chopped Beef, and Chopped Veal. Swift’s is the foremost name in meat for babies—“100% Meat!” If you must have something other than meat for your baby, Strained Carrots and Strained Apricots are available for the same price. There’s one more choice. You can call it Red Wagon Inn or Red Wagon Restaurant. The park uses both names. 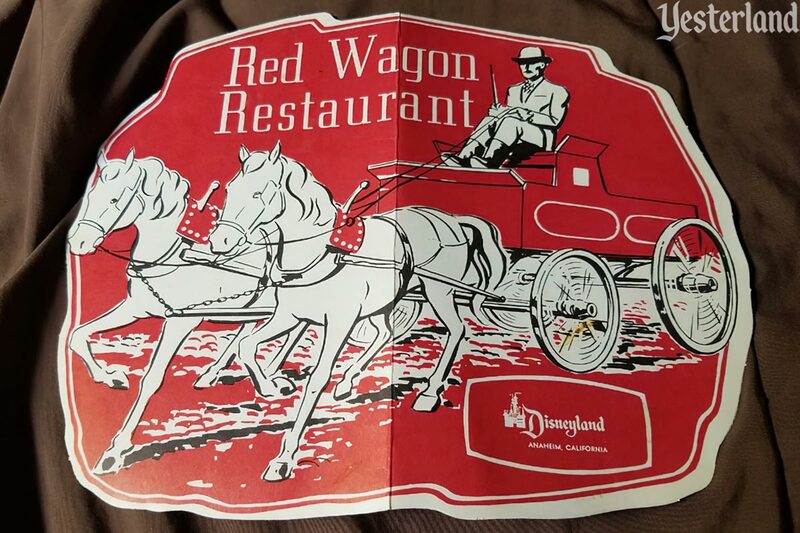 Red Wagon Inn was an opening day restaurant at Disneyland. Swift’s involvement was not just a sponsorship deal. 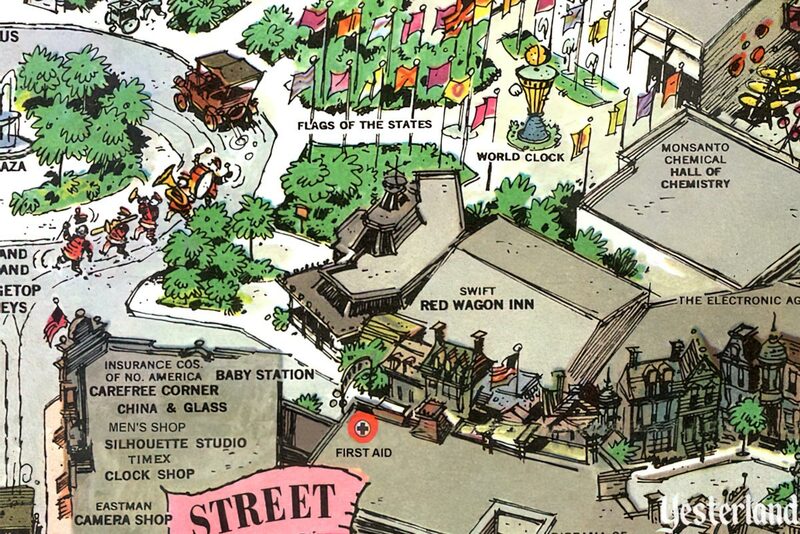 Although the Red Wagon Inn was designed by Walt Disney’s WED Enterprises, Chicago-based meat packer Swift & Co. developed and operated it as a lessee. 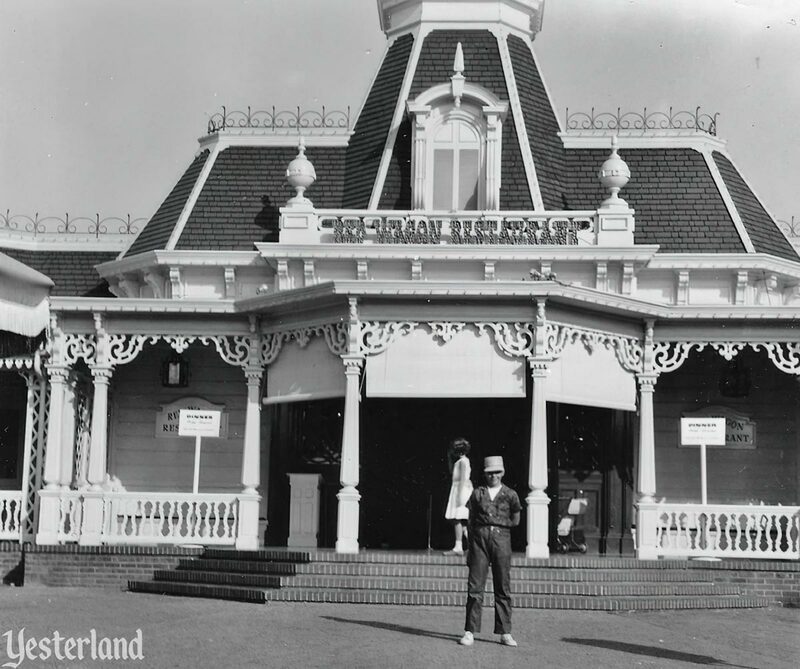 Swift & Co. was also responsible for the Chicken Plantation restaurant in Frontierland, “serving Swift Premium tender-grown Chicken” (1955–1962), Swift’s Market House (1955–1968) on Main Street, and as a supplier of meats and poultry to Disneyland food locations operated by other lessees. During Disneyland’s first decade of operation, it was common for outside companies to operate stores and restaurants in leased space on Main Street and elsewhere. 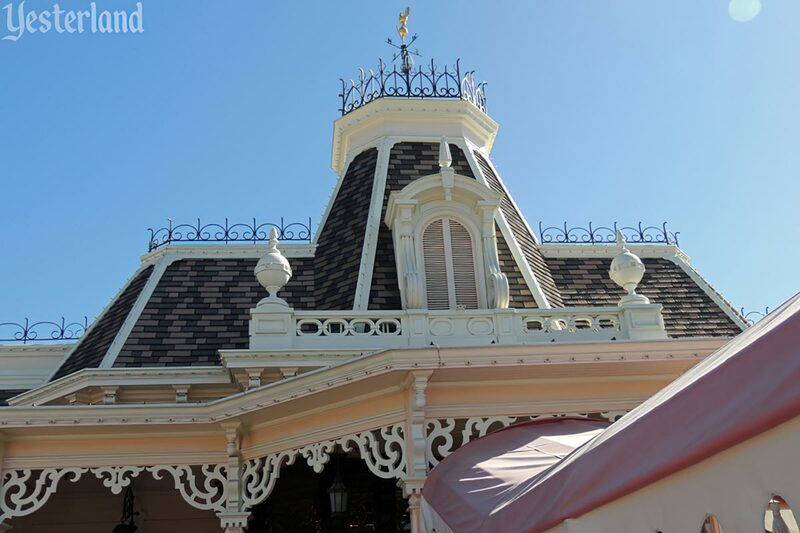 Walt Disney would have preferred to control the quality and “show” of everything in the park, but the limited financial resources of Disneyland Inc. did not allow that. Richard Lowry, 25, of Anaheim, said he stepped out of the rear of the park’s Red Wagon Restaurant to take the money in a bag to a bank deposit point. He said a man came up behind him, pressed an object in his back and ordered him through the gate of an employees’ area and into a rest room. The bandit, never seen by Lowry, took the bag containing the money and commanded the cashier to stay in the rest room for five minutes. Then the holdup man fled. 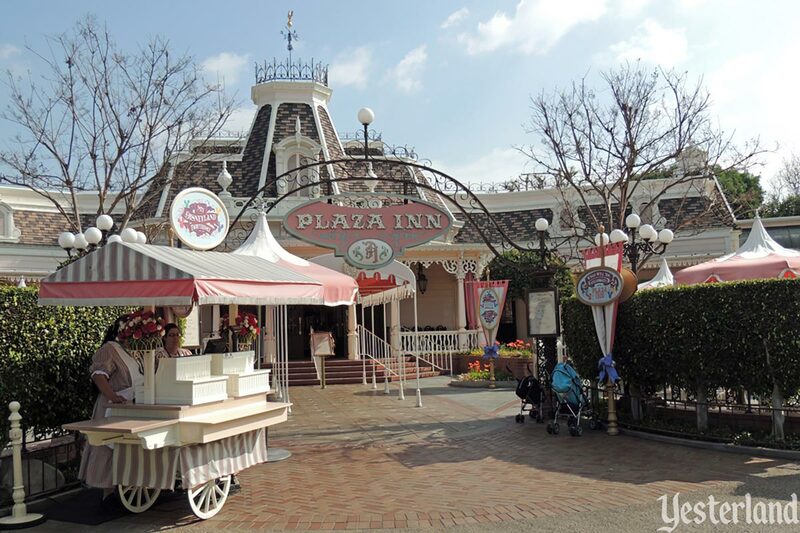 Police Investigating the supposed $10,000 holdup Sunday of the Red Wagon Inn in Disneyland reported Tuesday they found $9600 in a linen closet of the restaurant. Cashier Richard Michael Lowry, 25, Anaheim, who originally said he was held up, changed his story after lie detector tests. He was booked on suspicion of grand theft. 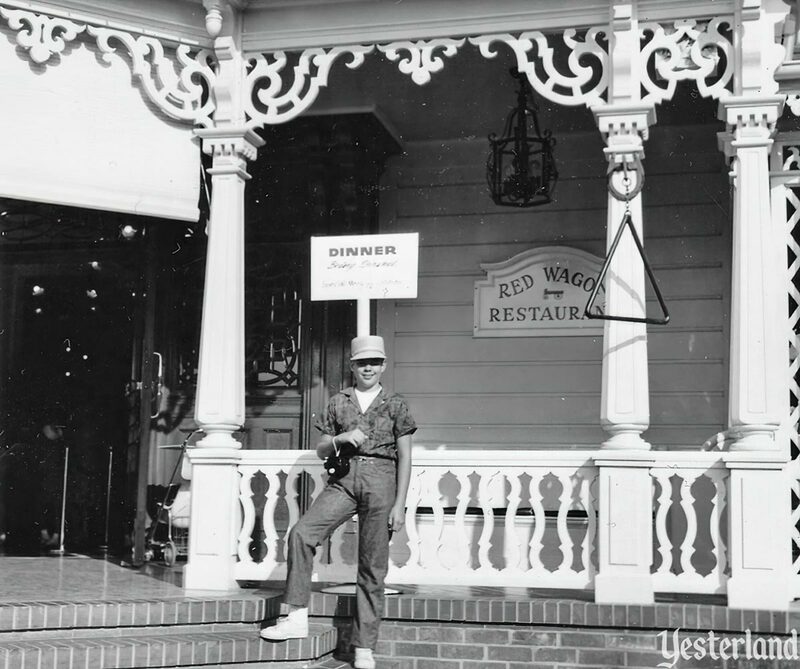 A different bit of news about the Red Wagon Inn seems to have been lost over time: the date when the Red Wagon Inn served its last meal before its extensive renovation to become the Plaza Inn on July 18, 1965—exactly ten years after the public opening of Disneyland. In 1960, Walt Disney Productions had taken full control of Disneyland, Inc. by buying out the ownership interests of ABC-Paramount and Western Publishing. The following year, the company paid off Disneyland’s loans completely. As leases ran out, Walt Disney was in a position to do things right. 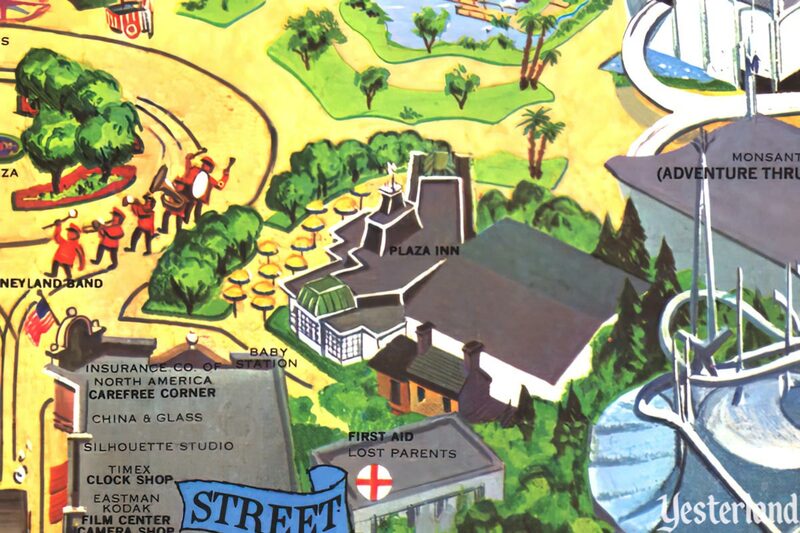 The Plaza Inn was far more than a name change. It was a case of Walt Disney doing it over to do it right. It isn’t every restaurant owner who goes around plunking out $1.7 million just to remodel a restaurant—particularly when it’s doing well already. But every restaurant owner isn’t Walt Disney, either. That $1.7 million is what Walt spent in completely re-doing what used to be known as the Red Wagon Inn, principal restaurant in his Magic Kingdom. 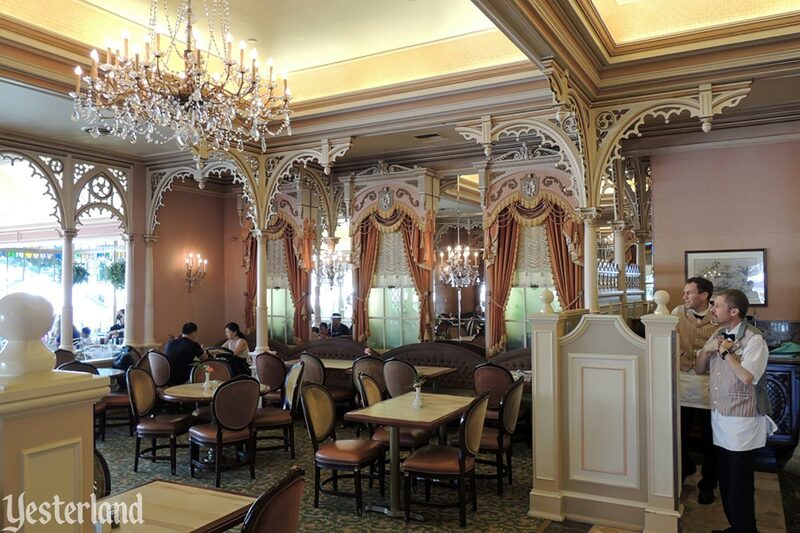 Renamed the Plaza Inn—because, I suppose, it fronts on Disneyland’s Plaza—the restaurant has been switched from a red leather, English tavern-type dining room into an elegant establishment that is strictly New Orleans in motif. Chandeliers drip from the ceilings and there is white wrought iron furniture in the patio and in the outside garden. Just as drastic as the alteration in decor is the change in food and service. Of course, each buffet line also has numerous meat and seafood entrees such as Tenderloin of Beef or Lobster en Brochette on a bed of rice. 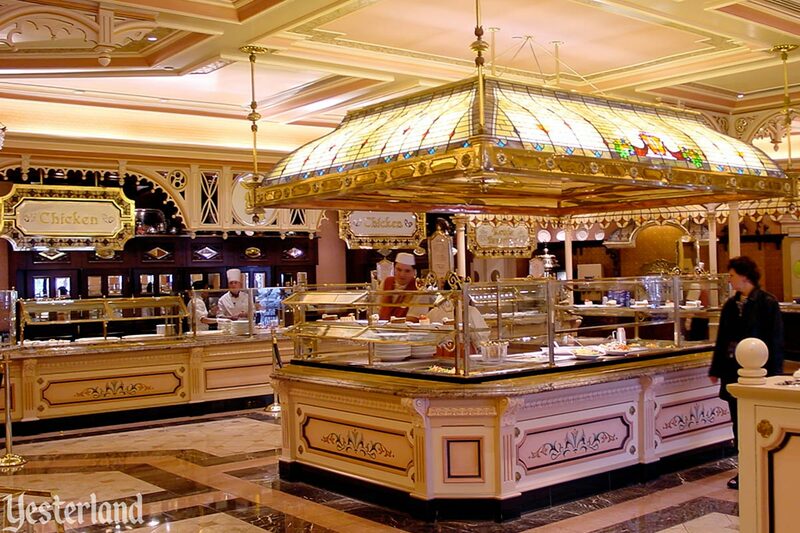 And, as you might expect, inasmuch as the restaurant operates its own bakery on the premises, there is a wide variety of French pastries and pies and cakes. Included in this $1.7 million remodeling job was a wholly new kitchen and bakery over which presides Buddy Kababa, executive chef. It is one of the finest I have ever seen. But, I contend that the public is less interested in what a kitchen looks like than what comes out of it. Right? 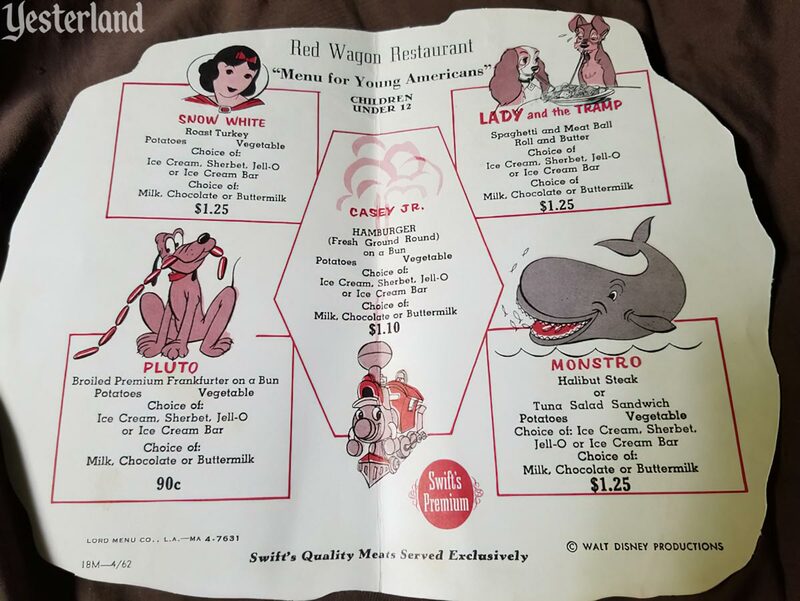 Dinner at the former Red Wagon Inn—which was one of the many concessions at Disneyland—ran as much as $4.50. 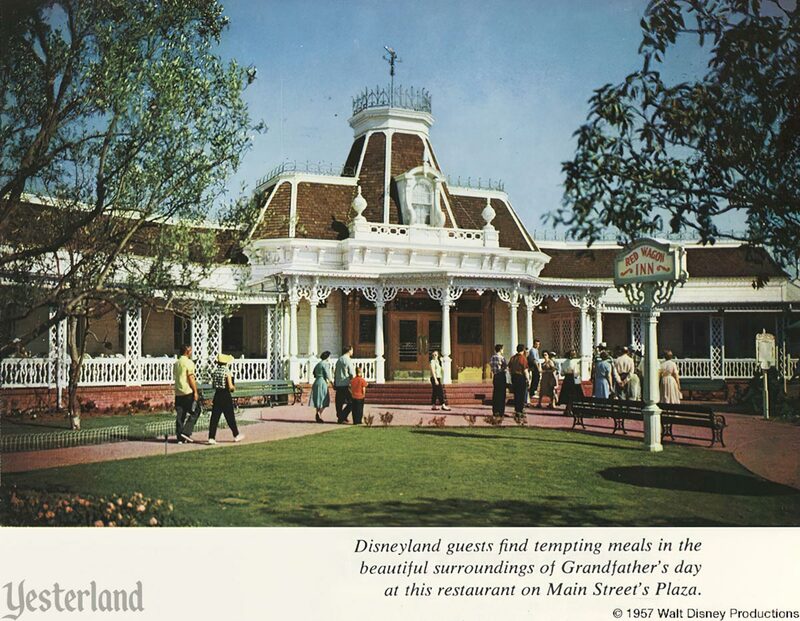 Now, with the restaurant owned and operated by Walt Disney Enterprises, Inc., the highest price for dinner is $3.25. Luncheons are $2 to $2.25. When there was table service at the Red Wagon Inn, the time for a party to be waited upon and consume a meal was estimated to be about one hour. With diners serving and seating themselves, they figure a meal there will take something like 30 minutes. 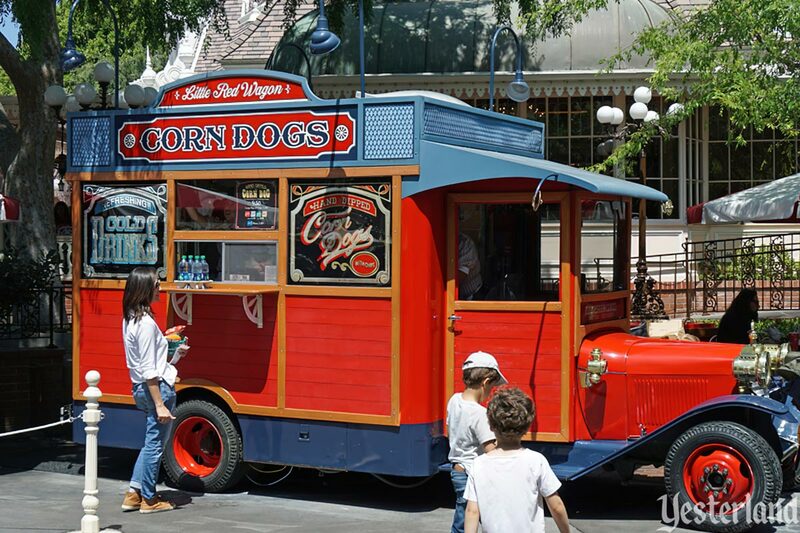 There’s no longer the Red Wagon Inn, but there’s the Little Red Wagon selling corn dogs, not far from where the Red Wagon Inn parked its horse-drawn red delivery wagon. So is that a Swift Premium Skinless Wiener in the hand-dipped, golden-fried corn dog? Probably not. But there are Disneyland guests who consider it to be the best corn dog in the world.